Elegance in Lake Mary. Love was the theme at the elegant wedding hosted by Arianna and Michael. They came to the amazing Lake Mary Events Center to host their affair! From the drapery framing the floor to ceiling windows with that amazing view of a wonderous lake, to the very words that they spoke, love was the theme of their event. The very first words spoken talked of the essence of love. “Love is a promise that is always kept, a fortune that can never be spent, a seed that can flourish in even the most unlikely of places”. Lon Tosi of the Central Florida team of Sensational Ceremonies spoke those words as he did once again when he read the magical words that they had written to one another. “Arianna, I will love you, hold you and honor you”! I will respect you, encourage you, and encourage you”. Michael, I promise to always be faithful, true to you and support you. I promise you that I will be your biggest supporter, and kiss you every night”. Such beautiful words of love. 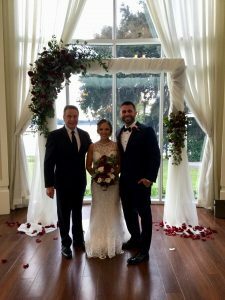 Lon Tosi worked for many months with the bride and groom to create a magical ceremony that spoke to the true core of the love this couple feels for one another. They wrote letters to one another and placed them into a wine box for opening on their one-year anniversary. Love letters for the future! What a great concept! A Wedding Blessing started with the following sentence that provided them with wonderful guidance on how to deal with their future. “Treat yourselves and each other with respect, and remind yourselves often of what brought you together”. Words of wisdom for certain. The amazing team of A-level vendors that attended to the needs of this couple. They made it all come to life with precision! Big City Celebrations led the way with their fantastic event coordination. Hundreds of Moments captured everything in photographs and video. DJ Live Productions the amazing Orlando based DJ company executed both the ceremony sound and the reception with style and grace. Of course, the florals were delivered and installed by Flowers by Leslie who has always made a major mark on the Orlando Florida wedding scene. Just look at the florals in the attached photo! Gorgeous! Sprinkles Custom Cakes provided the scrumptious cake, and Le Petit Sweet delivered tasty Macaron Favors. The bridesmaids and bride looked like runway models thanks in part to the work of Kristy’s Artistry Design Team. A Chair Affair, as usual, provided outstanding rentals, and Over the Top Rental Linens made them look even better! Thanks also to the following vendors: Arthur’s Catering, Swag Décor, Lily’s Bridal, Men’s Warehouse Orlando, and Elegant Wedding Invites. What an amazing group of vendors! All are the very best!